This hexagram is the opposite of the last hexagram, that for Thunder (archetype 51). 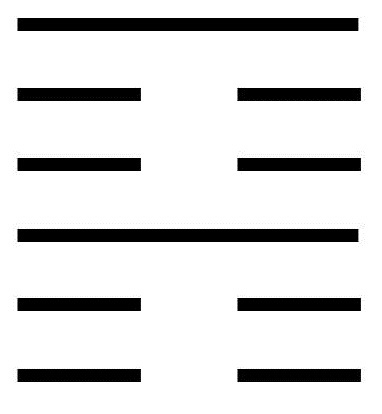 Both of these hexagrams consist of a doubled trigram, and both trigrams consist of a single strong line and two weak lines. In Thunder, the solid line is at the bottom of the two broken lines. Now the solid line is above the broken lines, where it can rest peacefully in its natural position. The image of Stillness is Mountain, which conveys an eternal picture of stillness. In this hexagram, we have Stillness doubled, which conveys the great calm Jesus spoke of. To understand that the nature of calmness is being still when stillness is called for and moving when movement is called for. To take the time to quiet and center the mind. To persevere in the quest for stillness despite the difficulties. To let go of the struggles and tumult of daily life. To turn to the world only when a state of calmness has been achieved. To see past the storms and tribulations of Ego and cultivate the faith and wisdom that lead to inner peace. To acutely focus the thoughts on the immediate problem. A moving line in the bottom position counsels on the importance of holding still, especially in the beginning. This is a time when mistakes have not yet been made, and there is a natural harmony with Wisdom’s way. Ego has not yet run amok, and one can more easily see the truth of things as they are. It takes effort and resolve to hold to stillness at the beginning, but the effort is worthwhile. A moving line in the second position warns of being carried along by the motion of one’s superior. Even if one is striving to build a centered calm, there is little one can do to mitigate the anxious thoughts of those in power. A moving line in the third position describes a calm that is brought about through force. True calmness comes about naturally and cannot be forced. If one is trying to force calmness through meditation and/or other approaches, the result is a phony calmness that is really a mask for Ego. This creates the potential for considerable harm. A moving line in the fourth position tells us that the highest stage of rest is one in which the Ego has been completely silenced. At this time, this goal has not been achieved. Still, one is making important progress and is encouraged to continue. A moving line in the fifth position warns that one is in a dangerous situation and feels out of control, and that one is inclined to be careless in speech. This exacerbates the situation. On the other hand, if one is careful with words, these words gain power. A moving line in the top position describes one who has achieved great inner tranquility. Everything in life can now be approached from a position of calmness. A person like this is a source of peace and calm that has a universal impact.